Payment reminders are a great way to automatically make sure your clients don't forget about upcoming due dates (that means less work for you! ), but you can turn them off if you'd prefer to choose when and who to remind about upcoming payments. By default, payment reminders are turned on, but you can easily toggle them off in your Company Preferences section. 2. Select Company Settings from the menu. 3. 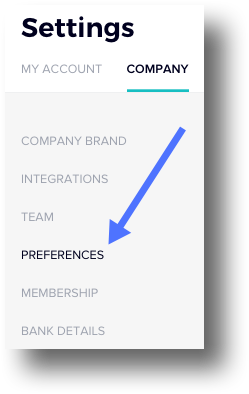 Select the Preferences tab. 4. Scroll down to the Actions section. 5. Click the radio button to toggle Send my client payment reminders OFF.